FeastHome – The compact circular kitchen is suitable for any kitchen size. Whether you have a small kitchen or a spacious kitchen, you are always able to apply a compact circular kitchen. You can have this style of the kitchen if you are bored with the common shape for the kitchen such as a rectangular kitchen or square kitchen, and you want to have an anti-mainstream one. Are you confused about how to have a compact circular kitchen? Check these inspirations out! 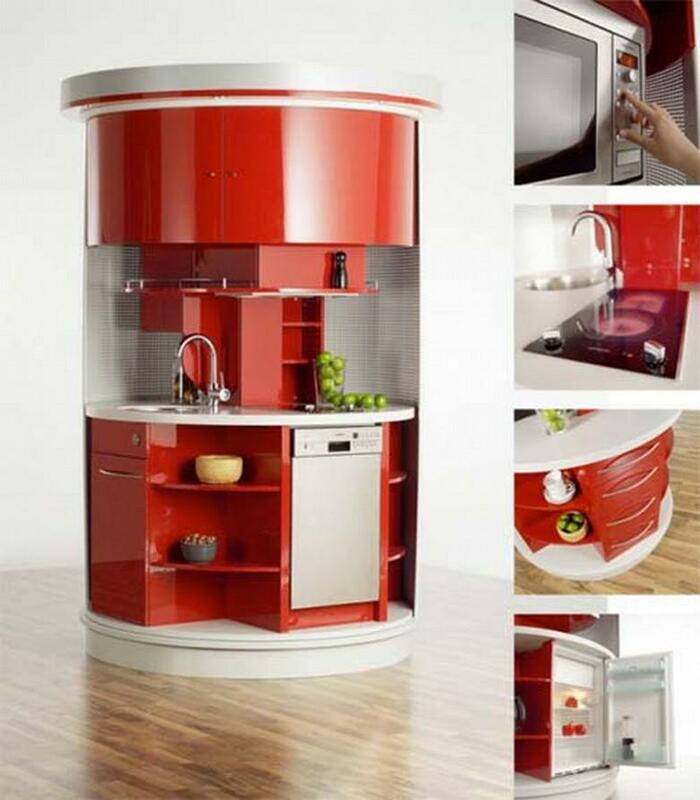 This compact circular kitchen is really suitable to be applied in a small area. Even though it is small, it does not mean you can have anything you want for your cooking activity in this kitchen. The cabinets to store the cups are designed to be opened. The small refrigerator is installed just like a cabinet, a great idea to save some spaces in the area. 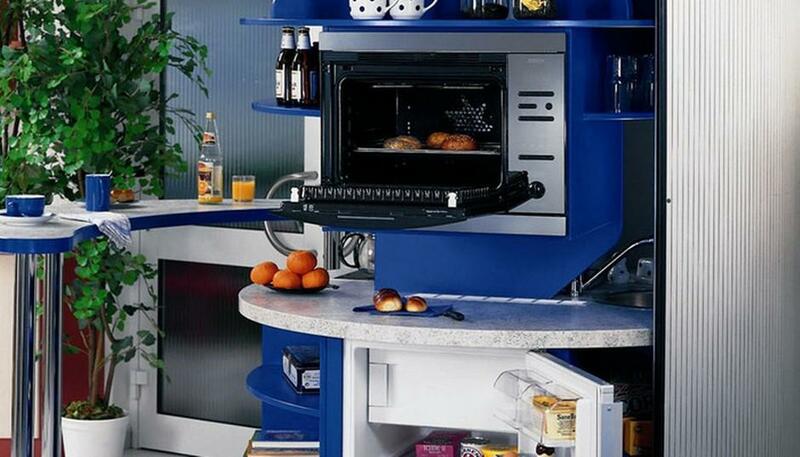 This kitchen can even have an oven by installing it above. If you have a tight area for a kitchen in your house, you can follow this idea. This idea is suitable for you who live alone in an apartment studio. The kitchen area and dining area are designed for only one person. The design of this compact circular kitchen and also the dining room is very unique. The kitchen area is designed semi-close, making it looks like a small room. The cabinets are openly placed in the front, once again, a smart idea to save spaces. The householders use the monochrome colors in order to bring a simple and modern look. The high dining table and dining chair makes the modern look even stronger in a unique way. If you are getting bored with the neutral colors or monochrome colors to be applied in your kitchen, you can try this kitchen idea. The red color dominates this compact circular kitchen, making it looks more playful. The design makes this kitchen idea is perfect to be placed in a corner space. There are 2 huge kitchen cabinets on the top that allow the householders to store a lot of tableware or kitchen utensils. The sink, kitchen cabinets, and small fridge are placed close to each other, suitable for you who demand a practicality. Gather up the blue lovers! Combining blue and grey is just so right for this kitchen idea. The kitchen area is placed in the corner and the dining area is placed on the other side. The dining table is even the half circle shape, matches perfectly with the compact circular kitchen. The kitchen table and dining table are both using a marble material so that you do not have to be worried about a heavy cooking activity. The strength of marble is no joke. The dining area is closely placed to the kitchen area, making it easy for the householders to prepare the meals. It is the details of the screaming red compact circular kitchen in number 3 above. As you can see, the built-in stove is used in order to save some spaces in the area, as well as the use of a small fridge. The cabinets are available in 2 types; the closed one and the opened one. So that the householders are able to store the kitchen utensils and tableware in the closed cabinets and place some decorations in the opened ones. This kitchen is designed in a perfect circular shape. 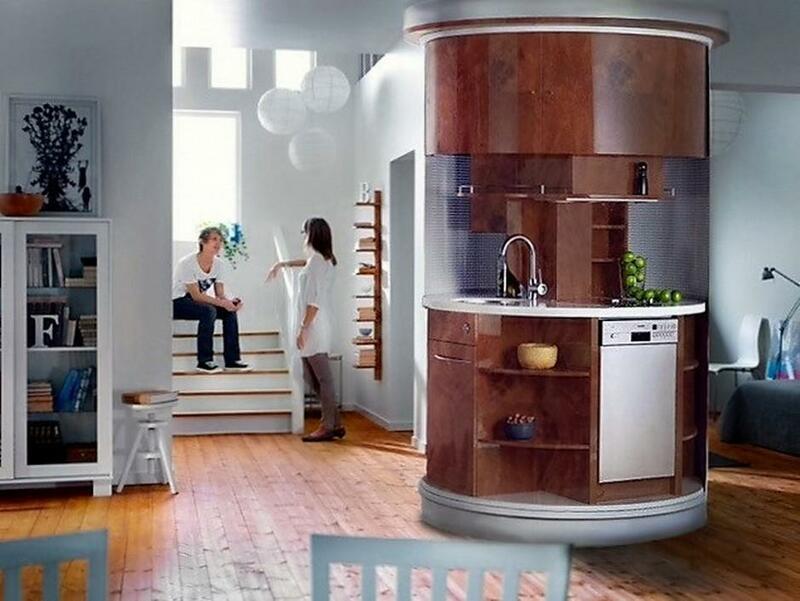 What makes it so unique is, this compact circular kitchen is placed in the middle of a room, and it is not even a dining room. The small size makes it possible to be placed in this area. For you who want to have a unique layout in your house, you are able to follow this idea. The natural color from the wooden material brings a warm atmosphere to the area. A compact circular kitchen is very practical so that it will be easy for you to do your cooking activity. The kitchen elements such as a sink, cabinets, stove, and others are placed close to each other. Moreover, the cabinets used in this style of a kitchen are usually designed to be opened. So that you do not have to be bothered about closing and opening the cabinets to take some spices out. Because the cabinets of a compact circular kitchen are openly designed, they are easy to clean and tidy. So that your kitchen will always look neat and clean. It will be also easy for you to look for the kitchen stuff you need. A compact circular kitchen tends to be simple and minimalist. This is very beneficial to make the room or the area looks clean, neat, and more spacious. This style of kitchen will also make your vision range wider so that it is easy to find the objects that you need. 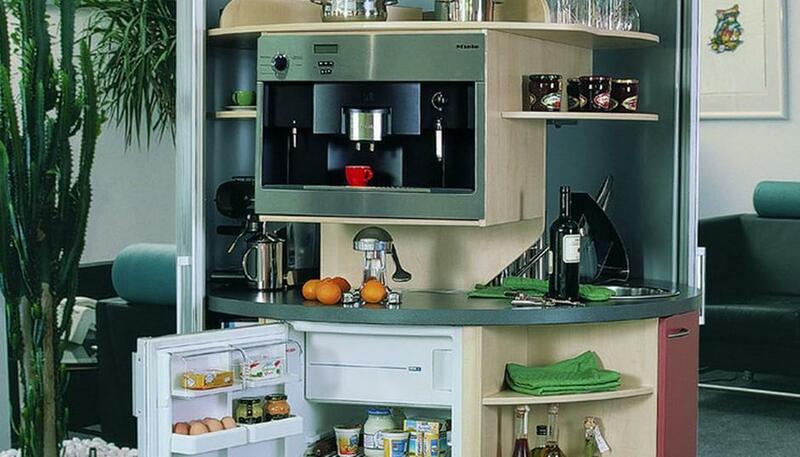 By having a compact circular kitchen, it will be easier for you to be creative. 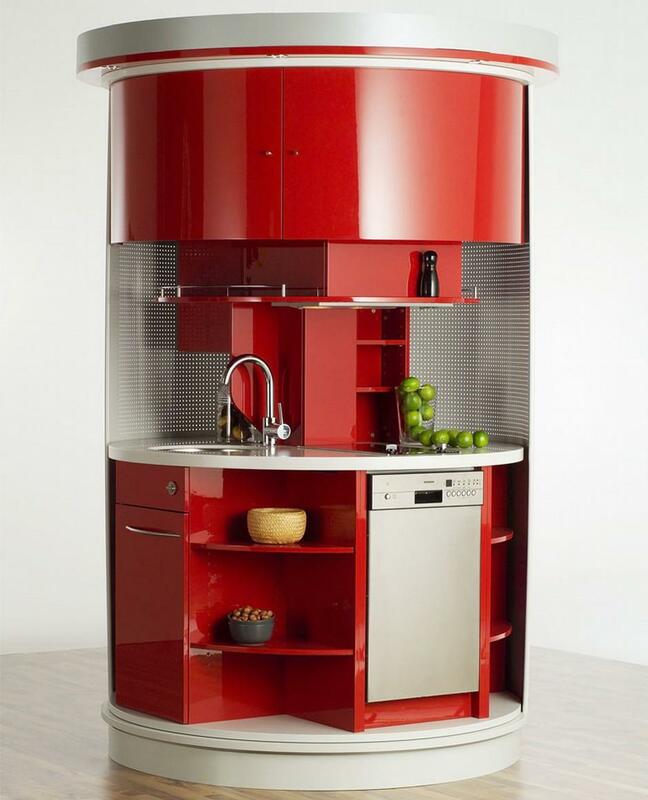 The compact circular kitchen itself is already creative since it is really rare. Because the most compact circular kitchen is small, it will not cost you a lot of money to renovate it. You are also able to easily change the decorative cups, dishes, jars, and many more as you wish because of the opened kitchen cabinets. A compact circular kitchen will add the aesthetic value to your house. This kind of kitchen will be the center of attention in your house. Its attractiveness is able to be seen from far away. Moreover, if you properly decorate your compact circular kitchen, it will bring a warm and homey atmosphere to your house. So, do you still doubt to have this style of kitchen?